Austin, Texas was Ground Zero for geeks and hipsters of all stripes at the beginning of March. Computer geeks, internet entrepreneurs, Justin Timberlake and marketers from all types of entertainment industries found themselves there for this year’s South by Southwest (SXSW 2013). A music festival, film festival and interactive trade show/conference all wrapped up into one, it was the place to be. Films such as EVIL DEAD and SPRING BREAKERS (makes sense) premiered during the 10-day festival. THE INCREDIBLE BURT WONDERSTONE (didn’t make sense) all premiered there. Yeah, if you were interested in connecting your product with the young and hip opinion leader, SXSW 2013 was the place for you. So, naturally, it was a good business strategy for Marvel Comics – newly acquired by Disney – to have a presence where all of these eager content consumers were. To make a big splash, Marvel offered all SXSW conferees 700 #1 Marvel Comics for free via the digital comic service, comixology. 700 FREE COMICS to a manic group of computer geeks!!! Some of these were the most prized comics in the Marvel Universe. Fantastic Four #1. Avengers #1. Amazing Spider-Man #1. I don’t see a problem, do you? Seems the offer was TOO GOOD TO PASS UP, so few people did. As it turned out comixology, the leading online superstore for digital comics, crashed, burned and died under the weight of all of those anxious SXSW attendees trying to access the free comics. But this wasn’t the worst part of it. Since comixology’s servers were all shocked and awed, that meant that regular comixology subscribers all over the country couldn’t access their comics for days, including Wednesday or better known as New Comics Day. They were booted off every time they tried getting on to their comics, the ones they had paid for. Well, that possessive pronoun “their” is a bit misleading. If you’ve purchased something but you can’t access it in any way other than online, is it really yours? See, this is my big problem with Digital Comics. I get the storage issue and the convenient portability of one’s entire collection on a Kindle HD or iPad. But when I walk into a local comic shop (LCS to the true believer), I walk out with real, 3-dimensional comics I can touch, pass along to a friend or attempt to resale. Digital comics give me none of this. They are less mine permanently and more like if I borrowed my friend’s car. I might have used it to get somewhere quickly once or twice, but I can’t rely on it being available all of the time because it ain’t mine. Case in point, this self-inflicted wound that comixology subscribers suffered has got them to finally realize the true nature of their relationship to the comics they’ve purchased through these services. It is a controlled access system just the way Marvel and DC wants it. They’re afraid of bootlegging and other forms of piracy, but, for some reason, they don’t seem to be afraid of losing customers. Does this pattern sound familiar? 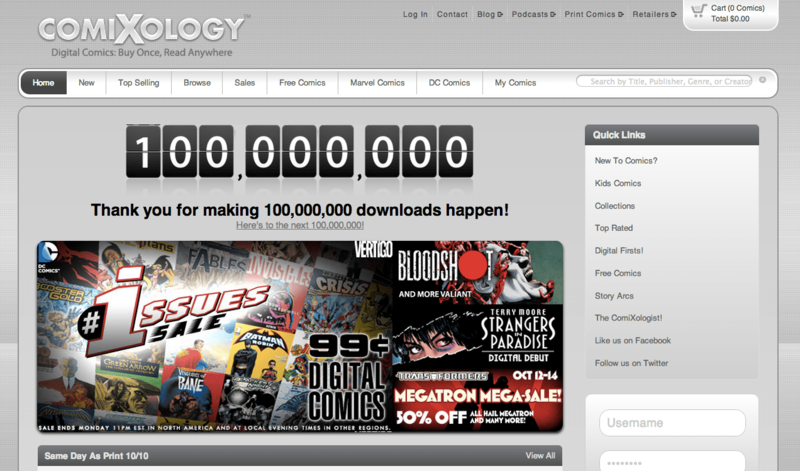 After the initial shock, many of comixology’s subscribers are starting to question the company’s commitment. What if the company folds? How do I get what I paid for? Well, the quick and easy answer is you might not. Thanks to the fears in the Comics Industry, every digital comic is formatted to DRM (digital rights management) which means you don’t own the books. It’s more like you are renting them for an extended period that may ends whenever the company says it does. This is the reason iTunes beat out all of the subscription music services over the last decade. When you think of dropping thousands of dollar on content you want to always listen to or read what you bought. You don’t want to be told you need to shove more quarters in the meter to see it or that this service is discontinuing. Yeah, Marvel didn’t know what they started but it might lead to an interesting developing in the desire to push digital comics as the wave of the future. Next Next post: Crowdfunding TV: A Good Thing?